Take a look at our FAQs page for more info. Within the festival site and built up on the hills overlooking the bay are 80 air-conditioned apartments all with balconies or terraces. There will be room for 283 people and these will surely go quickly so book early and don’t miss out!! 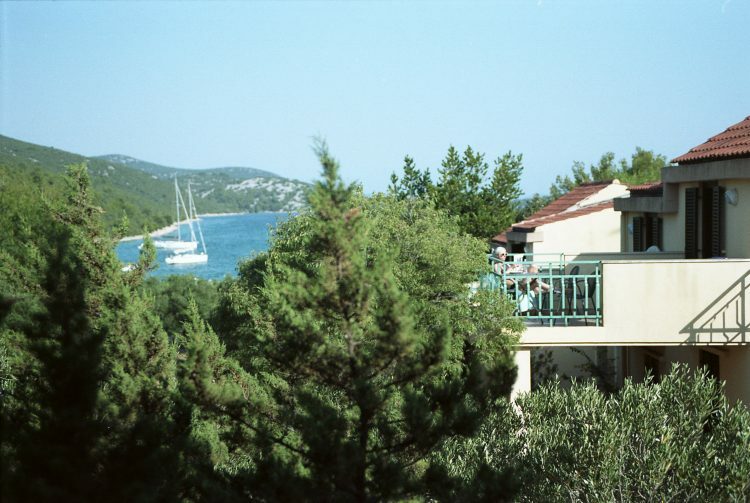 The onsite apartments all have air conditioning, small kitchen, and balcony / terrace – and bathroom with shower & WC. Towels are provided for the bathroom but please bring your own beach towels. 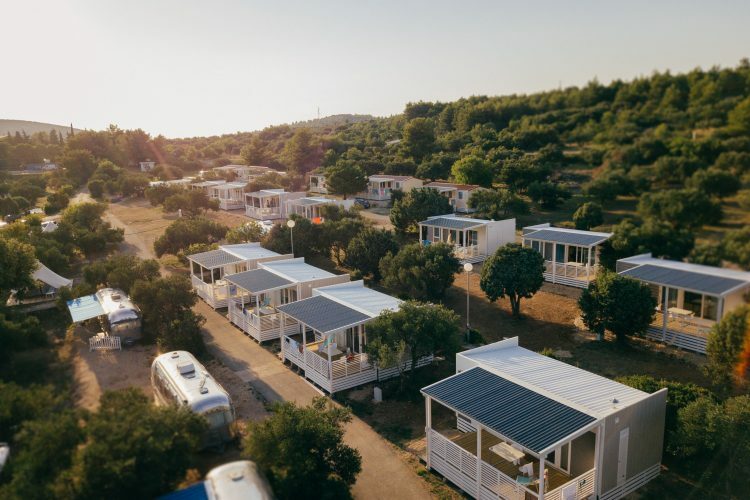 The Garden site have a selection of different styles of mobile homes, starting at €160. 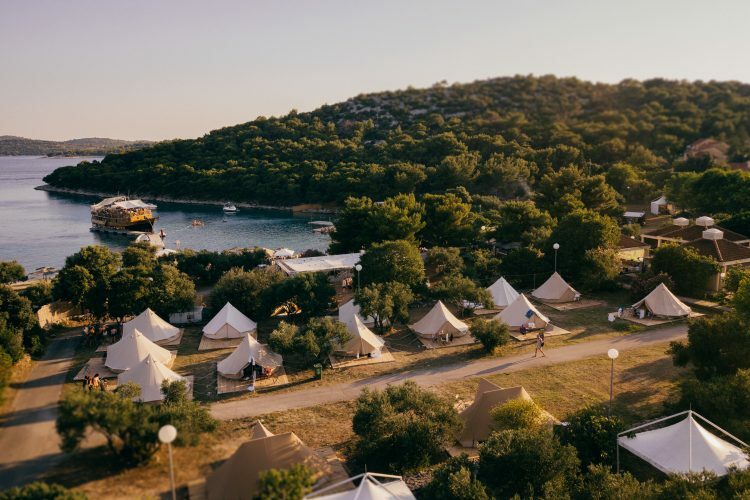 For 2019, the Garden site are able to offer camp pitches amongst the olive & fig trees, for those of you who wish to bring your own tent and camping equipment onsite. 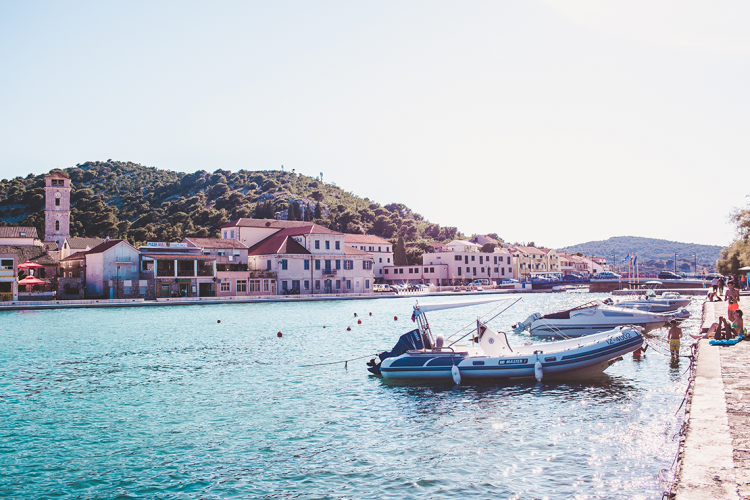 For campers there is nothing better than waking up in the morning and having a refreshing swim in our private bay followed by fresh coffee and breakfast at Trattoria Magnolia onsite. They are of course however, limited in the number of people they can allow to camp onsite, so ensure that you book early to avoid disappointment. Included, is access to the high-quality communal WCs and hot showers specifically for the camping/glamping area (separate for girls and boys), but please bring your own beach towel. Small secure lockers are available for rent at the reception. The price per person €17.00person/day – booking fee & tourist tax included. These iconic, refurbished trailers are a masterpiece in design – exciting, inspiring, and the absolute ultimate in cool and comfort. Arriving from the USA, these shiny aluminium trailers can each sleep 4 people. They have their own capsule shower & WC and are air-conditioned, and each airstream has got its own kitchenette, which includes a fridge to keep your beverages perfectly chilled. Outside your trailer, you can relax in deckchairs in the shade under the awning and watch the stars at night. Even on the rare cloudy night, twinkly fairy lights ensure you can relax under the stars. The airstreams are the perfect option for those wanting something a little different; to add a little more style, comfort and fun to their festival experience. The price of an airstream is 130.00 EUR per day- booking fee & tourist tax included.